Throughout history, church pews have played a pivotal role in Sunday worship. 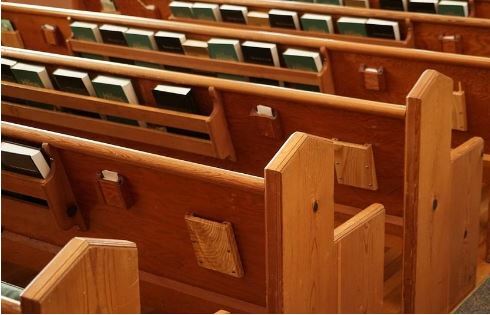 If your congregation is updating its chapel with new or used church pews for sale, you may want to take a few moments to better understand the history of church pews and how they’ve evolved throughout the centuries. Dating back all the way to the 13th century, backless stone benches were used for congregations to sit on during church sermons. Advancing to the 14th century, wooden pews began to replace stone benches. By the 15th century, wood pews were common in many congregations. It wasn’t until after the Protestant Reformation that pews became a fixed staple in many churches. These pews came at a substantial cost to the congregations, often becoming the personal property of the family that paid for the pew. Since their early days, the basic structure of church pews hasn’t changed a lot. One of the biggest differences nowadays is that pews are considered to be public property, no longer belonging to a single family. While the basic structure has stayed the same, there are three different styles of pews see today. The most common style of church pews is the standard style. This particular style of pew is composed of all-wood and are simple, yet elegant. Standard pews are straight benches, providing congregations plenty of room to sit throughout every sermon. The wood that is used to make a standard style church pew will vary, with the most common being oak. Additionally, colors and fabric choices can vary from congregation to congregation. Another difference that can be seen with standard style pew benches, is the pew ends. Another staple feature found on standard style pews are upholstered cushions. Most cushions are installed on both the backrest and seat of the pew. These cushions provide added comfort for congregation members. The radial pew is similar to the standard style pew, in the fact that they too are made of all-wood and can be finished in different styles. The biggest difference being the radial pew is slightly curved. The curvature allows the seating to face a single focal point at the front—generally the altar or pulpit. This slight curvature makes it easier for larger congregations to see the front of the chapel. Box pews are not nearly as common today as they were in the past, but they are still one of the most common styles throughout history. Box pews are distinct in the fact that they are fully encased in paneling. Most variations of box pews were straight pews that are enclosed with a little door that latches at the end. The reason for the enclosure was to provide patrons with more privacy. A majority of box pews were used in churches in New England, where churches were not typically heated. The enclosure helped keep out drafts, keeping members of the congregation warmer throughout the sermon. As you can see, church pews have evolved over time, adapting to the needs of the congregations and churches they’re in. When congregations are wanting to update their pews or return to their roots, used church pews for sale can help you to find the look and style that is right for your church on a budget.